A citizen might expect the Texas Department of Housing and Community Affairs (TDHCA) Board of Directors to spend most of their time developing an effective state housing policy or working to make sure the State uses the funds wisely to help house the poor. The TDHCA board has for years spent 90 percent of its time and the agency’s staff time hearing procedural complaints from developers about the competitive process for the award of Low income Housing Tax Credits. Case in point – today’s housing agency board meeting. Arcane discussions about interpretation of rules and appeals from developers whose applications scored low due to developer “typographical errors” consumed virtually the entire meeting. It is the same story at every board meeting. The State of Texas has a board overseeing the housing department that has become captive to the competitive games played by developers and their attorneys instead of serving poor renters who just need an affordable place to live. The board chair summed it up at today’s meeting , “This [the Texas housing tax credit program] is a big game.” A game for developers but a serious failure for half a million poor Texas families who spend more than half of their income to pay the rent and desperately need affordable housing. While this isn’t new it is disappointing. The new board leadership at TDHCA immediately acknowledged this problem on taking over. Unfortunately, the new board has allowed the development industry to keep the board playing the game. Don’t misinterpret this as simply the problem of the board. This “game” has been played for a long time and everyone contributes to keeping it going. Housing Tax Credit developers are a means to an end — the provision of affordable housing for those who need it. In Texas developers are the end, the middle and the beginning of the State’s housing program. 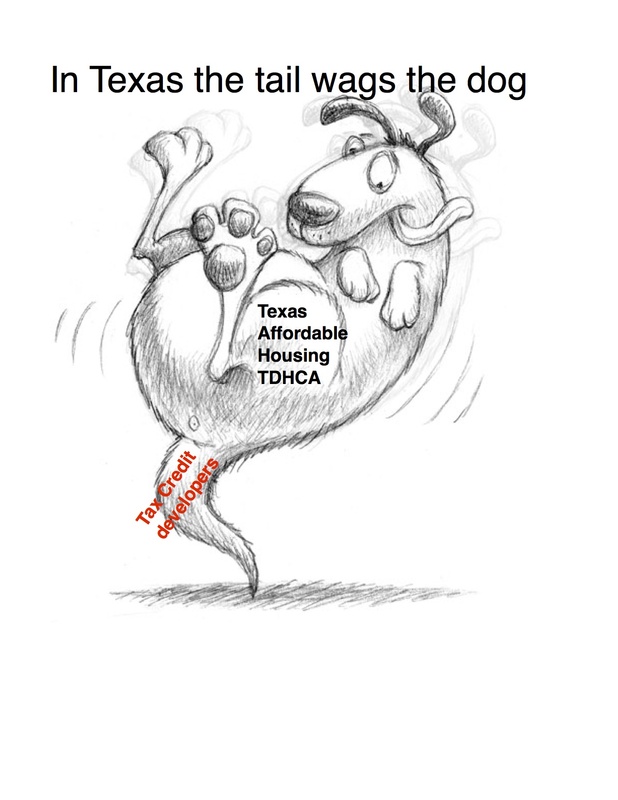 This entry was posted in State issues and tagged Low Income Housing Tax Credit, TDHCA, TDHCA Board, Texas Department of Housing and Community Affairs. Bookmark the permalink.